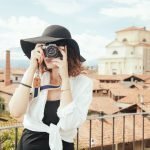 Making a list of the best places to visit in Croatia is not an easy thing for me since there are so many wonderful spots to explore. Endless beaches, thousands of charming islands, crystal clear Adriatic waters, Mediterranean climate (on the coast) and continental climate (in the plains and the mountains), incredible national parks and nature parks, exquisite gastronomy, lovely old towns with some of the centuries-old architecture and ten World heritage sites are some of the reasons why anybody can fall in love this country. Nature and outdoor lovers will love Croatia because it offers numerous adventure activities, no matter if you prefer to stay in the mountains or by the sea. You have a wide range of activities from rock climbing, endless water activities, walking, hiking, cycling, cricket, canoeing, canyoning, trekking, windsurfing etc. Maybe you want to experience Croatian islands and if you want to know more about how you can do it, read our post about island hopping in Croatia. Those loving history and culture will also find something for themselves. Some monuments, buildings have trails of the Roman Venetian and Austro-Hungarian era. Even parts of some cities (Split, Dubrovnik, Trogir) are historically preserved and protected by UNESCO (also the Cathedral of Šibenik, the Basilica of Poreč, Stecci tombstone graveyards). The best time of year to visit Croatia also depends if you want to go to the mountains, the coast or make a city tour. My general suggestion is visiting Croatia in May/June and September/October when there are fewer tourists, prices are more reasonable and weather is still warm with plenty of sunny days. You can swim and sunbath from May to September. Unlike high season – “summer chaos” with overcrowded tourists, stifling hot weather and steep prices. The advantage of this period are some events held in high season only. Croatia is now more accessible and easier to visit than ever before. You have plenty of options on how to reach Croatia – by road, by plane, by train or by boat. If you are thinking to reach Croatia by air – there are many flights operating from most places in the UK and Ireland. 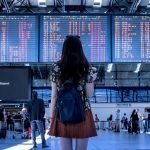 And not only that, we have a good news coming for US travelers! After many years it will operate the first direct flight by American Airlines, between US and Croatia and will start in summer 2019. 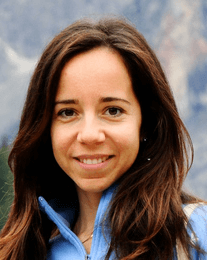 Another option is also flying to a well-connected city (Germany – Frankfurt or Munich, Italy – Rome) and then continuing from there. Croatia is a peaceful and safe country. However, like in any foreign country, as a tourist you should specially take care of your personal belongings. Occasional thieves can appear in trains or in crowded public places. In general, there are no serious issues or harmful threats reported by tourists. For more travel tips in Croatia click here. Let’s have a look at our list of Croatia holidays destinations. Isn’t this place on the photo beautiful? 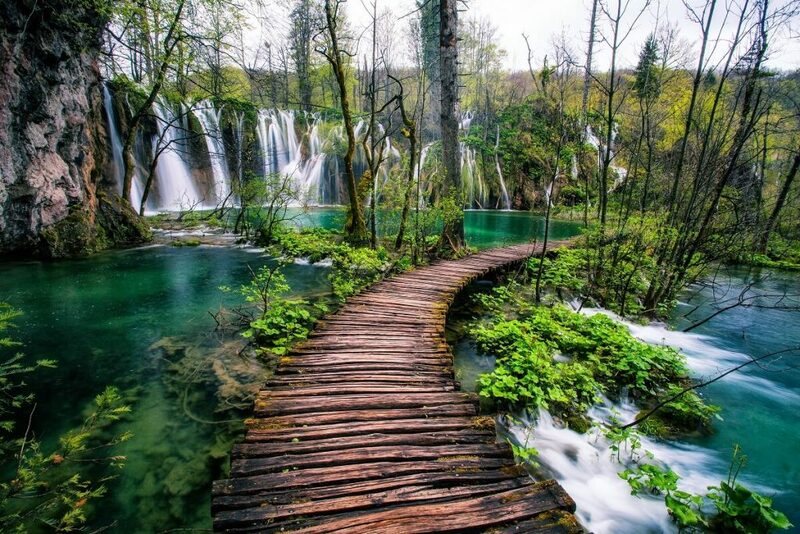 This is certainly one of the most stunning and most visited places in Croatia – Plitvice lakes. If you feel connected with nature, you are a nature lover or you are curious and simply want to spend a day in this natural beauty, this is the place to visit. Plitvice Lakes is the largest national park in Croatia, also added to the UNESCO World Heritage. The boardwalks will lead you to the most amazing views of the Plitvice lakes – you will be impressed by its lakes with cascades and waterfalls, crystal clear water and much more. This incredible nature has made us think that Plitvice Lakes deserves the first place as one of the best places to visit in Croatia. 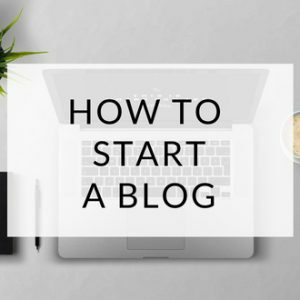 You can further read about it in this guide. If you’ve heard about Croatia, probably you’ve also heard about Dubrovnik, too. Dubrovnik is the most popular an visited tourist destination in Croatia. It’s not difficult to imagine why is like this. Rich in history, numerous lovely beaches for every type of traveler, delicious Dalmatian food, many cultural festivals and events, plenty of glamorous restaurants, nightclubs, very kind and hospitable locals etc. 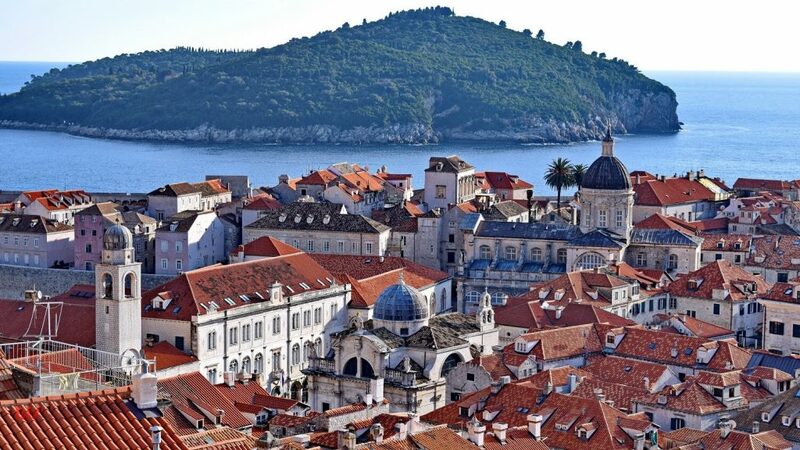 Dubrovnik is most known for its charming and historic Old Town, stone walls from the 16th century, the most preserved medieval cities in the world. The walls are easily accessible and possible to walk to admire spectacular views of the Adriatic sea with a backdrop of rugged mountains and nearby lush green islands. 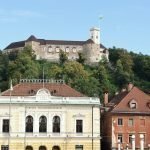 There are various buildings with baroque, Gothic and Renaissance style, which now represent the historic center. 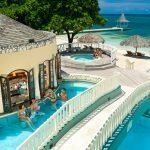 After a long walk and exploring Old Town with ancient history you can treat yourself at one of the beaches with crystal clear water and later watch the sunset in a remote place or in one of the outdoor bars with subtle music. If you like outdoor activities, there are some options for you – climbing Petka hill or Srd hill where at the top all of the city and the offshore stretch out before you. Take a walk to the park Saint Orsula with a small amphitheater where many performances take place. The emphasis of Dubrovnik cuisine is Mediterranean specialties. The food is based on olive oil, vegetables seasoned with rosemary, garlic, parsley, and basil. Many restaurants offer traditional dishes with fish and seafood, usually grilled with cooked potatoes mixed with chard. Another typical dishes you will find here are also influenced by Italian cuisine, like pizza, black risotto, green stew, dirty macaroni (similar to Italian Pasta Bolognese or Ragu di carne) and desserts like rozata (pudding drowning in caramel), arancini and limuncini (candied orange and lemon peel) and ston cake (pasta mixed with nuts, lemon zest, sugar, sometimes chocolate and butter, all bound with beaten eggs). Yet, in some restaurants, you can order more exotic dishes, like Mexican food, etc. Beware, prices are higher in Dubrovnik than elsewhere, however, you can also find more economic prices but consequently, the quality is poorer. A great place to see Dalmatian lifestyle, besides Dubrovnik is Split, Croatia’s second largest city. A good combination of tradition, history, and modernity. By arriving in Split you will become a part of a slow Mediterranean rhythm, having an impression of witty, sociable and hospitable locals (called “Splićani”). If you want to get in touch with locals, the place you can visit is the vegetable and fish market or the Riva – the promenade, most popular public space in the city with lots of cafes, restaurants, and bars where you can just sit, drink your morning or afternoon coffee like locals do. This is also a place for numerous entertainment events, exhibitions. This is also an important ancient city with great architecture and important attractions. Diocletian Palace is a stunning Roman monument and a World Heritage Site, built as a luxury villa and a Roman military camp. Within the palace walls, there are buildings, private homes, shops, bars, restaurants, labyrinthine streets full of people. Marjan Forest Park might be your choice to escape from the buzz of the city. 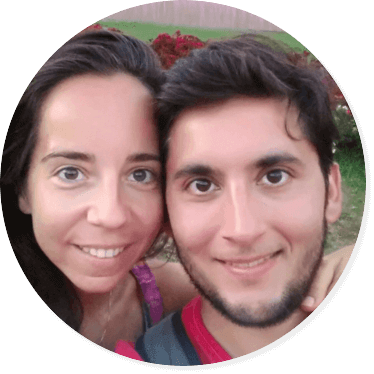 A place for jogging, hiking, cycling and extraordinary view of the city and surrounding islands. The Park covers the peninsula, also called “the lungs of the city” and is lush with pine forests with countless paths. You will probably not miss enjoying on the beach. There are many attractive spots for swimming, from sandy, pebbled or rocky beaches. The water is warm and turquoise clear. The Roman amphitheater is not only a famous sight in Rome but something you can also admire in Pula, the largest city in Istria peninsula. This well preserved and most famous attraction is also called Arena and is the sixth largest in the world. 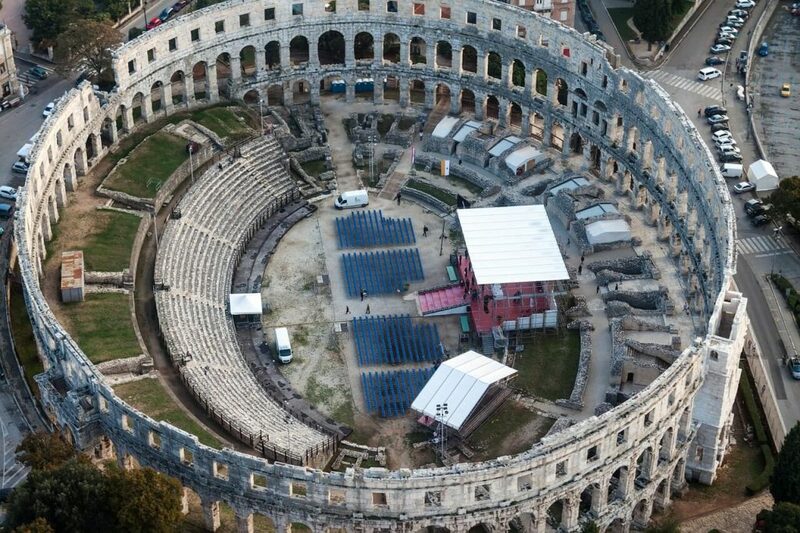 It was primarily used for gladiatorial combats, nowadays it hosts numerous events, like Pula Film festival, various concerts, sports competition, ballet, opera,… Many famous musicians have performed there include Luciano Pavarotti, Sting etc. Another sight is The Temple of Augustus, which was dedicated to Emperor Augustus. The Temple changed through years, from a church, granary, a museum for stone monuments to nowadays – a place of a collection of ancient stone and bronze sculptures. It stands on the Forum – the main square in Roman times and is close to the sea. 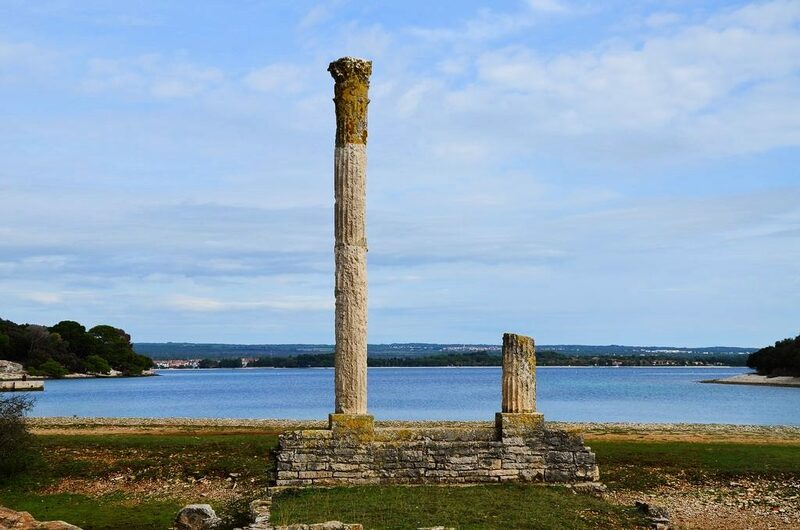 There are many more historical sights you can see, like Gate of Hercules – the oldest standing Roman monument, the Castle – primarily used for defensive purposes in Roman times, today it houses the Historical Museum of Istria, the Cathedral with parts from various centuries, etc. Apart from historical importance, Pula boasts beautiful beaches with clean water. The beaches are mainly rocky and pebbly. The most popular and best beaches are located in Medulin – Bijeca beach is the sandy beach spread more than 1 km along the coast, in Premantura, Banjole, and Fazana. In Pula, you must try some Istrian specialties such as brodetto (a fish stew), black cuttlefish risotto and other seafood dishes, and also Istrian prosciutto, fritaja (scrambled eggs prepared in many ways – with sausages, truffles…), maneštra (thick soup), the influence of Italian cuisine – fuži (made with eggs, flour and water) and gnocchi, some tasty sweets like kroštule, fritule and cukerančići. Once you are in Pula, take an excursion to Brujini islands which are easy to reach (frequent boat service). 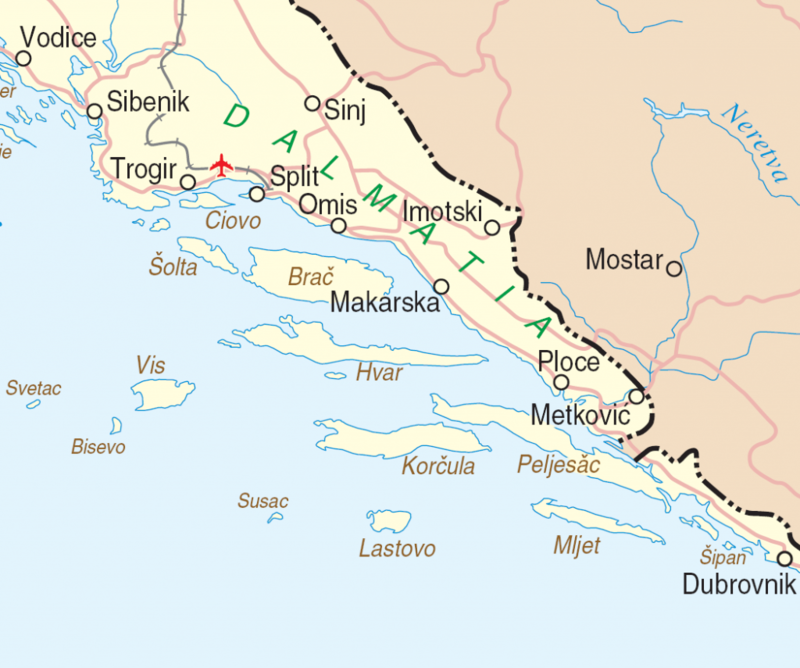 Brijuni islands are nestled on the outskirts of Pula’s port and consist of twelve islands and two larger islands (only possible to visit) – Veliki (Large) and Mali (Small) Brujin. Brijuni are covered by meadows, parks, and forests, surrounded by sparkling water. The islads are reach in Mediterranean plants and olive trees. This place is a blend of nature, history, and culture. In Roman times it was a valued summer getaway space with luxury villas, which you can see its ruins nowadays. The best way to see Veliki Brijuni is to take a “tourist train” which will guide you in the safari park and its animals and also to the Church of St. Germain. There are numerous restaurant options where you will enjoy meals based on recipes from the Brijuni history. 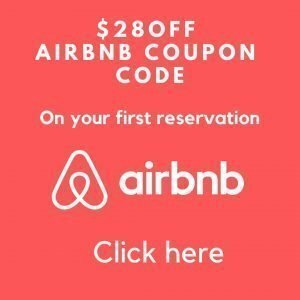 You can stay in two hotels and three villas (accommodation for 4 to 8 people). 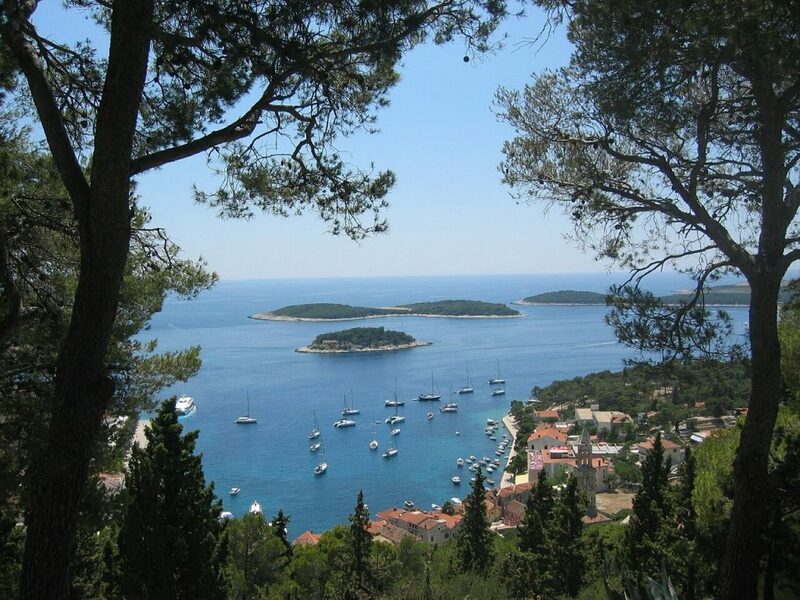 Croatia boasts more than a thousand magnificent islands and one of them is Hvar. Why is this island (among many islands in Croatia) on our list of the most amazing places in Croatia, you might ask? The sunniest island in Croatia with almost 2800 hours of sunshine per year which makes ideal for swimming and sunbathing. It is the most luxurious beach destination, also favored by the rich who sail with yachts. I like to call it a “herbal island” because it is covered with green fields of lavender, rosemary, thyme and it is also famous for its vineyards. 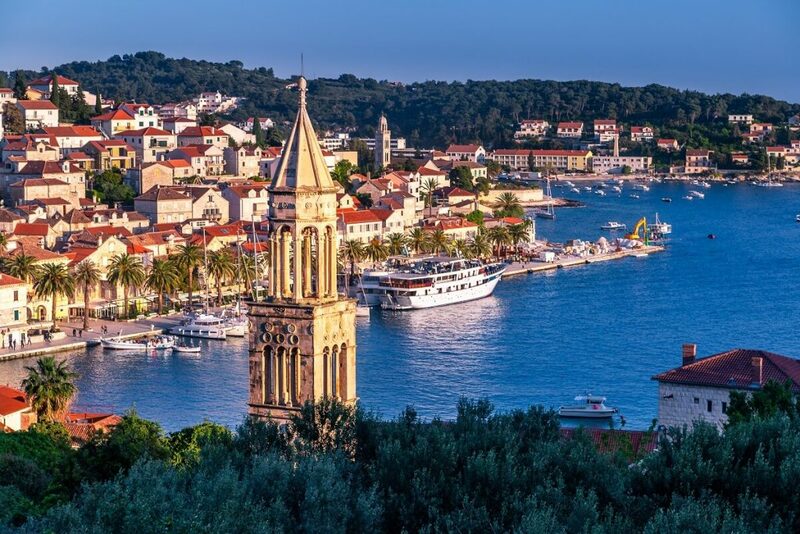 Towns and villages on the island have plenty of architectural and cultural monuments – St. Stephen’s Square and Cathedral, Franciscan monastery and museum, Hvar’s Renaissance theatre, fortresses on the hill provides with a view on the Pakleni Islands and the island of Vis. The island is easily accessible – there are regular connections with the island by taxi boats or ferry lines with Split, Rijeka, Zadar, Dubrovnik and some other islands (also from Italy). Numerous gorgeous and picturesque beaches and caves. The beaches are rocky and also some sandy beaches (in the northern part) surrounded by pine forests and Mediterranean bushes giving natural shade. The water is unpolluted and sparkling. There are also many attractive secluded cove beaches you can reach by boat or by car or foot. Accommodation options are for all budgets – hotels, private accommodation. Numerous restaurants, bars, nightclubs, party by day and parties until the sunrise. The best bar for sunset is Hula hula bar. The oldest olive tree on the island of 2,500 years is under heritage protection. If you like active and adventurous holidays, Hvar offers you various sports activities – cycling, kayaking, diving, snorkeling, etc. or take a taxi boat to Pakleni islands. 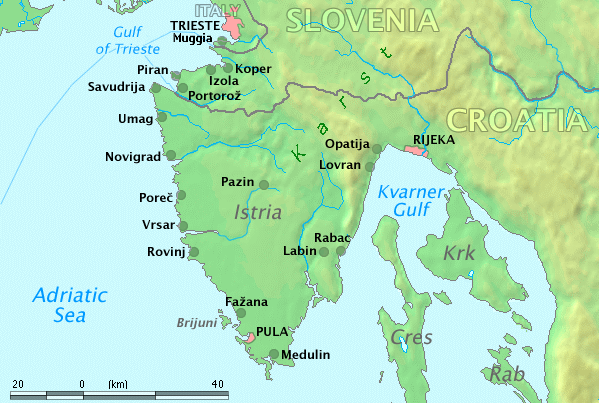 The Kornati islands. These islands are not typical as you might think. The islands consist of 140 islands and most of them are part of the National Park. There is no mass tourism (so you will not worry about noisy surroundings), no crowds at all, no permanent residents, small villages, semi-desert islands (very little shade) with simple houses in coves, no sources of fresh water and no electricity. Hmm… What can you do then and why do I suggest you visit the islands? If you are a fan of wild nature and minimal landscape and you need to get away from the hustle and bustle, just experience a different way of adventure, this might be for you. Yet various water activities are on offer, also hiking, some restaurants with local Dalmatian food. 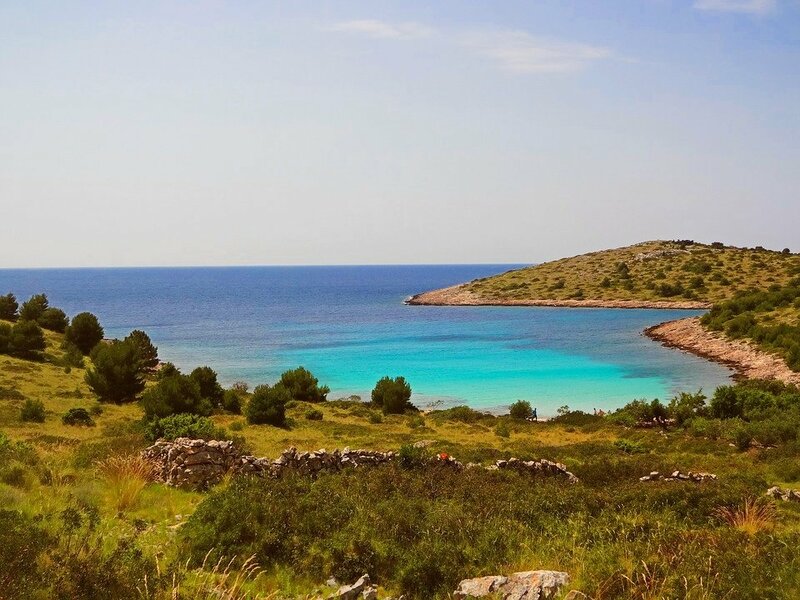 Maybe, after all, you don’t see yourself spending holidays in isolated islands like the Kornati, however, you can visit the islands by choosing an organized day trip by boat. 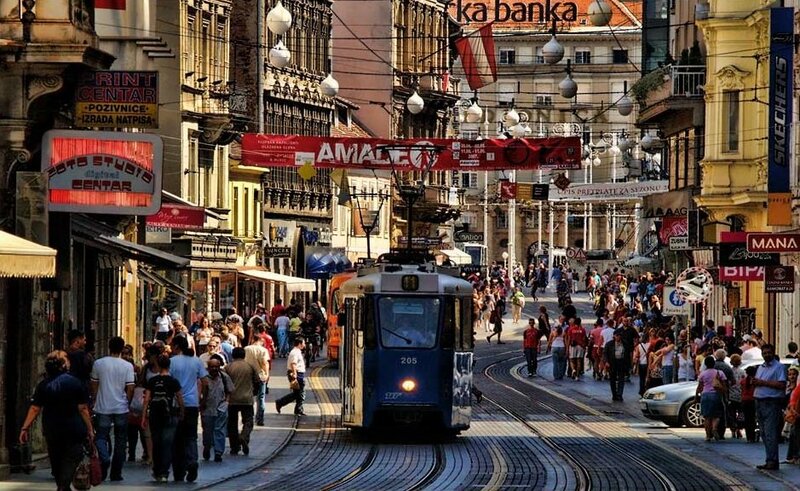 Zagreb, the capital of Croatia, is probably many times “neglected” or not on the list of destination by visitors when coming to Croatia, which is a pity. It’s true it doesn’t have beaches with a Mediterranean climate but it surely has many other benefits. My husband and I really love visiting Zagreb, for a day or two, so many things and places that we love there. 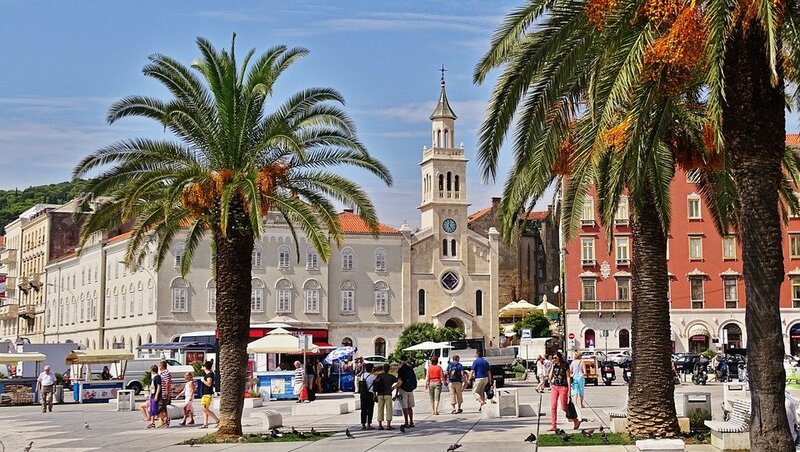 The vibrant street life, lovely cafes and bars, a wide range of restaurants sampling delicious Croatian dishes, nice lush gardens, parks, numerous events, interesting sights, etc. One of our favorite spots in the city is Maksimir Park. The park is an oasis of peace and tranquility and is perfect for walking, jogging, hiking, cycling or rowing boats on the lake. For the little ones, there are also playgrounds. The park reminds on English romantic garden with beautiful greenery, meadows, wooded areas, lakes and streams, also many paths and trails. A beautiful view of the park is from the central building with terraces. Do not miss the Dolac market in the city center with local fresh vegetable and fruit, also fish from the Adriatic Sea, souvenirs and other local products. 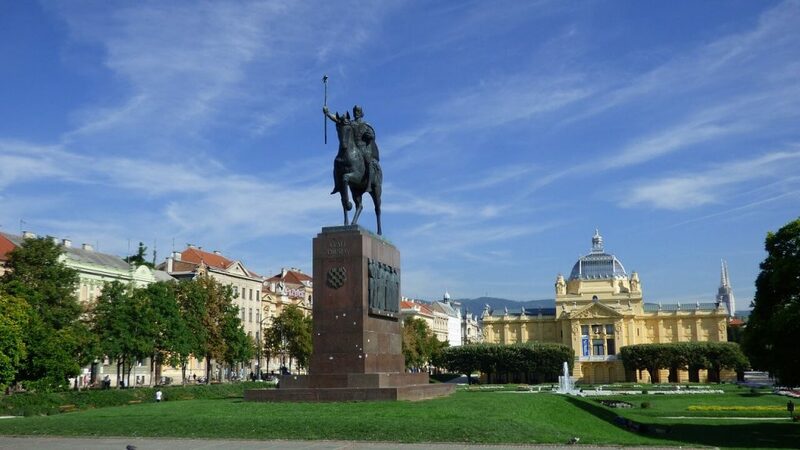 Ban Jelačić Square (Ban Jelačić is a Croatian hero) the main square with a fountain, where most people arrange to meet, it is also the main point where visitors start their city sightseeing. Another square that I love an I find it so much charming is Nikola Šubić Zrinski Square (also known as Zrinjevac) with its pavilion, perfectly well-groomed lawns, flowers, fountains and numerous cafes. It is also a perfect spot for many events and festivals. Some historical buildings are also worth a visit, like St. Mark’s Church from the 13th century with its beautiful tiled roof featuring the coat of arms of Croatia, Dalmatia and Slavonia, Zagreb cathedral with twin spires and Gothic structure with frescos from the 13th century, Lotrščak Tower from the 13th century to protect the south city gate, Funicular railway for the ride from the Upper Town to the Lower Town. The most spectacular view over the city is at the very top of the Zagreb Skyscraper. It’s only 30 kunas for children and 60 kunas for adults. Do you like our list of the best places to visit in Croatia? If so, please comment below or even if you don’t, share your opinion with us and let us know what you think about Croatia and its places.